Bond no. 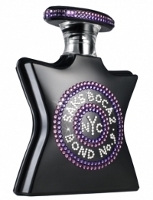 9 has launched Saks Boca 2, a limited edition fragrance exclusive to the Saks Fifth Avenue store in Boca Raton, Florida. Saks Boca 2 is the evening counterpart to 2008's Saks Boca. According to Laurice Rahmè of Bond no. 9, the new scent features "heavy notes like jasmine, gardenia, vanilla and musk. It's a spicy nighttime scent." I have the 1st Boca Raton, and it’s really lovely. I’d be very interested in trying the night version. A spicy night jasmine + gardenia does sound nice. I like that they’re not afraid to say that it has “heavy notes.” I like heavy notes. I just hate limited editions that you can only get in specific locales. At least in this case they’d ship it to you if you wanted it, unlike Le Labo. Le Labo won’t even ship? Fer cryin’ out loud. Who do they think they are? I totally wanted to try a few of theirs this year, but… what’s the point? No, no…just the “city exclusives”, not the whole line. And those they did make available for a limited time (and they might still be)…but in general, you have to buy them in the city in question. If I buy this, I’m totally doing a split. I just wish I didn’t hate Boca Raton (the town) so much. It’s very clean, very flat and full of gyms, convertibles, eerily oranged residents and boasts an enormous Cheesecake Factory. And 6′ wide beaches full of Mamas and their Nannies. Gracious. I’d take those beaches at the moment though. I used to shop there when we lived in Lauderdale. Boca’s a strange, strange place. And I can only imagine a “heavy” B#9…that’ll be a room-clearer! I really love that bottle. I like it too! Seeing the new bottle is, like, half the fun! I do like the matte black…not sure about the crystals but then I rarely like crystals. but PURPLE crystal Robin! Did you forget purple is my FAV color? HA! This sounds really nice to me. I imagine, though, that if they’re saying it has “heavy notes,” it must be pretty strong, because most Bonds already seem stronger than “average” to me! They don’t tend to be ethereal things. why is this Saks getting so much attention? why don’t they make versions for all the Saks Stores! Chicago, Boston, and i mean hell, there’s one here in Michigan too! i find this very distressing! They did make a Saks fragrance for all the Saks stores. My guess is that is particular Saks counters sell a ton of Bond and want their own scent, they’ll get it. The notes do indeed sound nice, but I am not sure I trust Bond No 9 to make a scent with them in that would be “right”. They almost all miss the mark with me in some way, sad to say. Mmmm… It sounds great though I’d happily settle for a more simple bottle at a lower price. I’m so behind on my Bonds, but this sounds really good. They did a simpler bottle at a lower price for Boca 1, don’t know if they did for this one too.